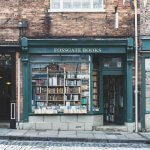 When it comes to literary themed travel, part of the fun is in finding the places to feature on The Literary Edit. 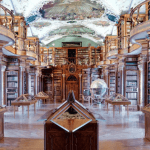 There have been many a night when I’ve found myself down hours deep in research, with an endless tabs open on my laptop as I search far and wide for the creme de la creme of hotels with literary links. 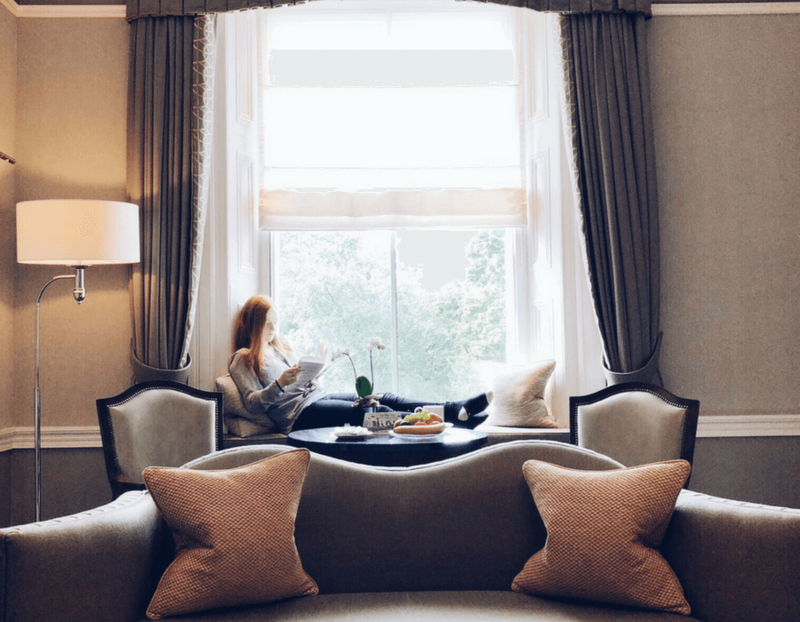 While a less obvious type of travel than most, for voracious readers around the world, there are few pleasures that rival the fusion of travel and books, especially when it comes to hotels like The Shelbourne. While I can’t profess to being a fan of James Joyce’s Ulysses, given that it has previously been voted as the finest English-language novel published in the twentieth century by a jury of scholars and writers, it’s impossible to ignore the novel’s significance in literature. And within Joyce’s epic novel that follows three men as they perambulate around the streets of Dublin, The Shelbourne is mentioned. Further cementing the hotel as a prominent part of the city’s literary history, it has also also hosted the likes of George Moore, Oscar Wilde, WM Thackeray and Joyce himself, while Elizabeth Bowen based her novel The Shelbourne on the hotel. 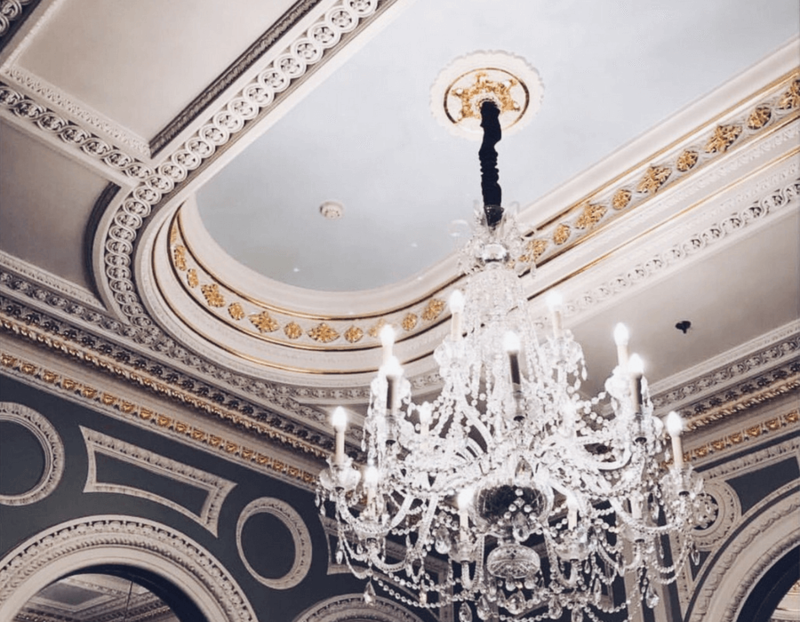 The first word that comes to mind on entering the lobby of The Shelbourne is opulence. Through its recent renovation, the hotel has not only maintained its charm, but also boasts an undeniably modern feel, with features that perfectly complement its Irish locale. 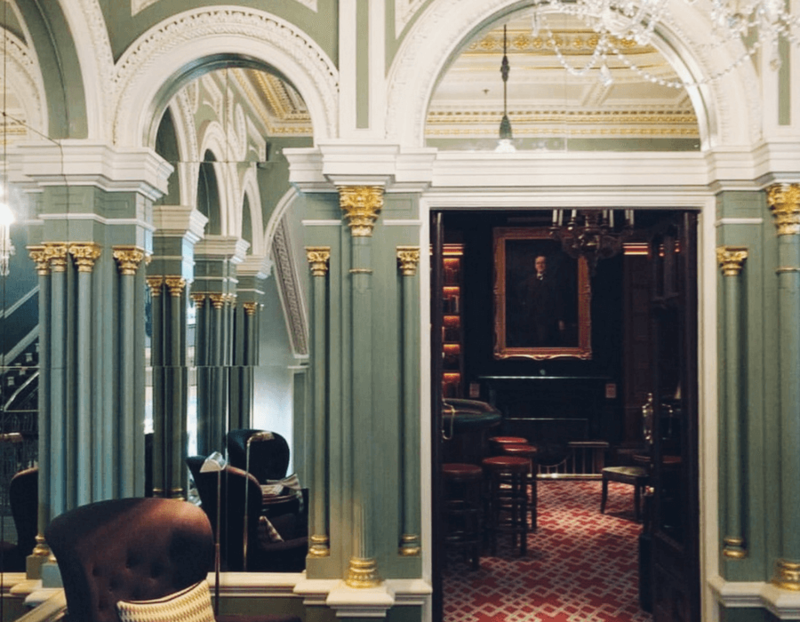 Every details has been thought of to ensure a thoroughly luxurious stay – from the menus in the restaurants and the bars, to the stained glassed crests of the counties adorning the grand staircase. It also doesn’t hurt that the incredible floral arrangements in the lobby are an Instagrammer’s dream. We stayed in one of The Shelbourne’s Heritage Suites, named after Michael Collins, another homage to the country’s history. For those unfamiliar with Ireland’s recent history, the suite’s namesake was a revolutionary who played a pivotal role in the Irish War of Independence, with the hotel being the site of the drafting of the constitution in 1922, overseen by Collins himself. The suite itself is flawlessly decorated, with gorgeous shades of green and pink with wooden touches, a sumptuous window seat perfect for reading – all topped off with one of the most luxurious bathrooms I’ve ever seen – I personally think sinking into the tub with a good book is one of life’s greatest little pleasures, and there’s little doubt that The Shelbourne’s bathtubs is one of the best for doing just that. 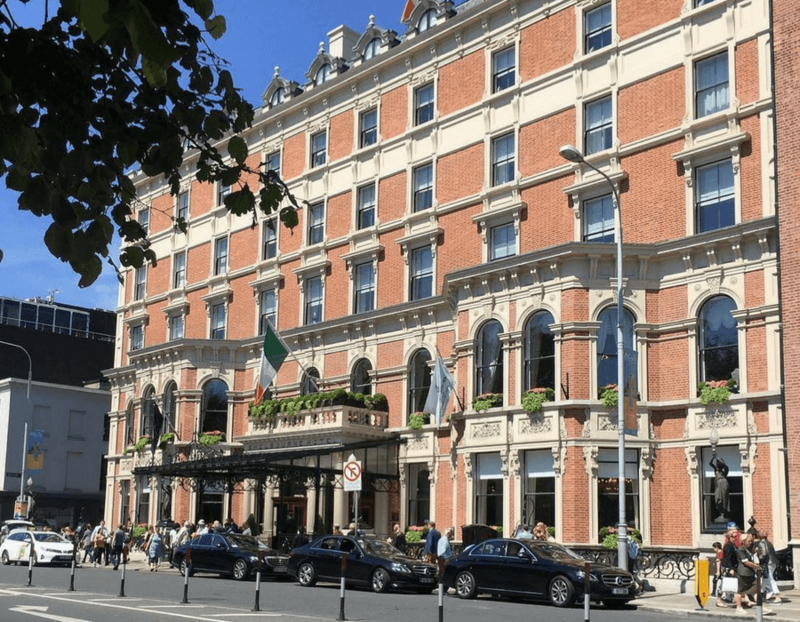 The Shelbourne is situated right on St. Stephen’s Green, so the rooms not only have incredible views overlooking arguably Dublin’s most famous park, but you’re also just a stone’s throw away from the infamous Grafton Street. Despite its proximity to the bright lights and buzz of Dublin however, once you check into your room, you’d be forgiven for forgetting the city’s on your doorstep, and instead absconding to enjoy a drink in the 1824 bar. 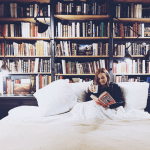 With bookshelves adorned with quotes from some of Ireland’s most celebrated wordsmiths and the cosiest of fireplaces, it’s just one of the many nooks bookworms can escape to and enjoy a tome and a tipple. 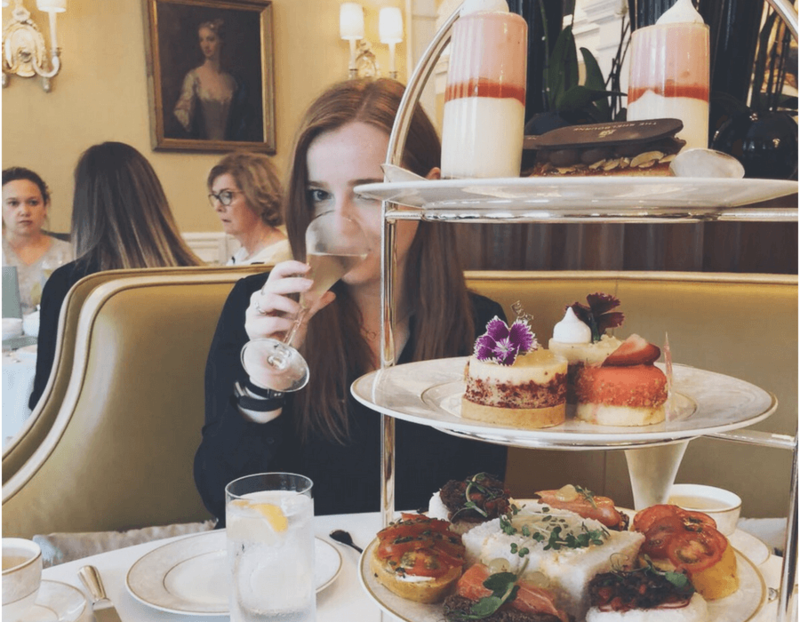 If you’re local but still want to enjoy the Shelbourne, their famous Afternoon Tea is not to be missed. In the Lord Mayor’s Lounge, you’ll be treated to a mouth-watering selection of teas. These are only outdone by the gorgeous stack of savoury and sweet treats – almost too pretty to eat; but there’s no denying you will. The atmosphere in the lounge is relaxed and warm and offers the perfect setting for an indulgent afternoon. Impeccable staff put all the guests at ease, from start to finish; and tea-time has certainly never been quite so effortless. We topped off our tea with a glass of champagne, my only problem with the experience was how hard it was to decide between the tea and the bubbles – a champagne problem indeed. 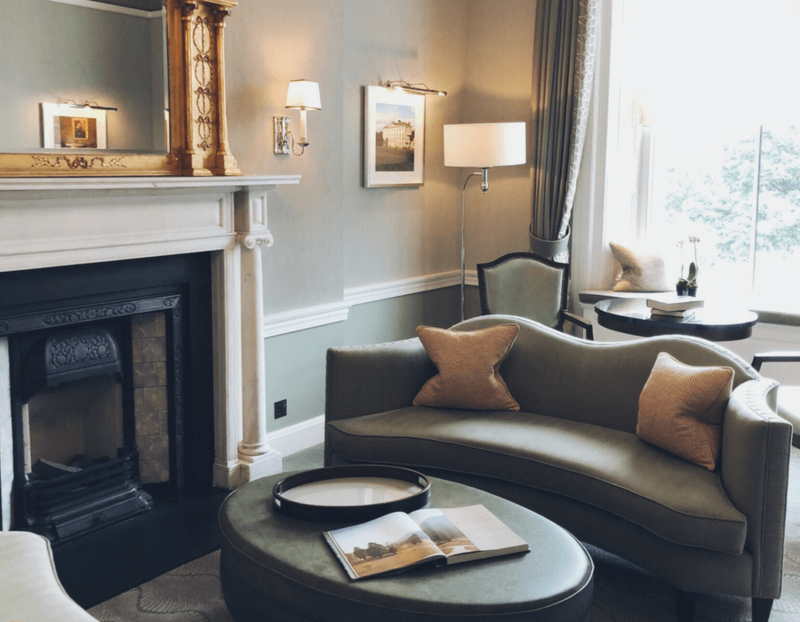 For modern day grandeur, seamlessly blended with tributes to its heritage, The Shelbourne truly is the perfect setting for a literary-lover’s getaway. If you’re driving, take the M1 South to City Centre. Left at Dorset St. Left down Parnell St. Right down Marlborough St. Across the River Liffey. Left at Trinity College. Right at Kildare Street, and the hotel is at top of street on left. The nearest airport is Dublin Airport, which is 14km away, and accessible by taxi, bus and Aircoach. Room prices start from approximately €591 a night.